Mark Beck struck 10 minutes from time to earn Falkirk a Premiership play-off draw at home against Hamilton. Accies' Jason Scotland missed two good chances early in an action-packed first-half which ended with Bairns' Conor McGrandles hitting the bar. The profligacy continued after the break until Darian MacKinnon curled in a great shot on the hour. But Beck finished from close range after good work from Rory Loy to set up Sunday's second leg in Lanarkshire. Hibernian, who finished second bottom in the top flight, await the winners and will be worried after a thrilling end-to-end tussle. However, both sides were guilty of a lack of composure in front of goal. Hamilton were unbeaten in four games this season against Falkirk, who had ousted Queen of the South after extra time in their quarter-final play-off at the weekend, and in the early stages the visitors had the upper hand. Falkirk defenders Johnny Flynn and Will Vaulks collided with each other, leaving Scotland with a free route to goal on five minutes but Falkirk keeper Michael Govern made a great block. Soon after, Scotland was sent clear by Ali Crawford and he rounded McGovern but the 35-year-old pushed the ball too wide and his angled-shot was cleared by Flynn. McGovern then had to make a point-blank save from Crawford and Anthony Andreu shot wide as Accies continued to dominate. 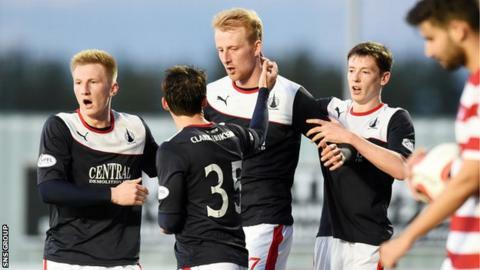 There was a strong Falkirk penalty claim when Blair Alston's shot appeared to be blocked by the arm of Hamilton defender Grant Gillespie but referee John Beaton was unmoved. Beck then had a deflected shot from 12 yards saved by Kevin Cuthbert and the visiting keeper pulled off a terrific stop to tip a looping header from McGrandles onto the crossbar. In between those Falkirk chances Hamilton captain Martin Canning's header from a corner was cleared off the line by Mark Millar. On 53 minutes, Beck headed a Millar cross straight at Cuthbert from eight yards, before the keeper made a fine save from Loy's drive. The breakthrough came when MacKinnon took a pass from Crawford at the left-hand side of the box and was given time to bend the ball past McGovern and in at the far corner. McGovern had to push Louis Longridge's powerful drive over the bar as gaps kept appearing in the home defence. But Falkirk were on level terms when Loy burst purposefully into the Accies box and cut the ball back for Beck to apply a simple, side-foot finish. McGovern was kept busy in the closing stages, making saves from Longridge and Mickael Antoine-Curier to leave the tie evenly poised. Falkirk manager Gary Holt: "I'm buzzing for the players that we managed to get something out the game, to keep the tie alive. "We wanted to keep the tie alive, to go into Sunday's game knowing it is a shoot-out and that's what we got. "Michael McGovern made some phenomenal saves but their keeper also made some wonder saves. I think it could have been 7-7 in the end. "When we went a goal behind I thought 'keep it at one and try to get a couple of days rest into them', but they managed to go again and we got the goal and it is an even cup-tie now." Hamilton manager Alex Neil: "I thought we played really well in the game and created a lot of clear-cut opportunities. "In the first 20 minutes of the game we had four real good chances where we should have scored. "I thought we were the better side. We moved the ball well, passed it well and even at the end we had two good chances where we should have scored. I thought their keeper was man of the match so I'm a wee bit disappointed but in terms of performance, really pleased. If we put in the same performance on Sunday, I am more than confident. "It is just a case of putting your chances away." Match ends, Falkirk 1, Hamilton Academical 1. Second Half ends, Falkirk 1, Hamilton Academical 1. Attempt saved. Mickael Antoine-Curier (Hamilton Academical) header from the centre of the box is saved in the top centre of the goal. Blair Alston (Falkirk) is shown the yellow card. Louis Longridge (Hamilton Academical) wins a free kick in the defensive half. Attempt saved. Louis Longridge (Hamilton Academical) right footed shot from very close range is saved in the centre of the goal. Corner, Hamilton Academical. Conceded by Jonathan Flynn. Substitution, Hamilton Academical. Andy Ryan replaces Ali Crawford. Mark Millar (Falkirk) is shown the yellow card. Scott Shepherd (Falkirk) wins a free kick on the left wing. Corner, Hamilton Academical. Conceded by Michael McGovern. Attempt saved. Darian MacKinnon (Hamilton Academical) right footed shot from outside the box is saved in the top left corner. Substitution, Hamilton Academical. Lee Kilday replaces Grant Gillespie. Attempt missed. Rory Loy (Falkirk) right footed shot from the left side of the box is too high. Goal! Falkirk 1, Hamilton Academical 1. Mark Beck (Falkirk) right footed shot from the centre of the box to the centre of the goal. Assisted by Rory Loy with a cross. Attempt missed. Jesus Garcia Tena (Hamilton Academical) right footed shot from outside the box is too high. Corner, Hamilton Academical. Conceded by Will Vaulks. Attempt missed. Ali Crawford (Hamilton Academical) right footed shot from outside the box misses to the right. Attempt missed. Rory Loy (Falkirk) header from the centre of the box is high and wide to the left. Corner, Falkirk. Conceded by Jesus Garcia Tena. Attempt saved. Louis Longridge (Hamilton Academical) right footed shot from the right side of the box is saved in the top centre of the goal. Substitution, Falkirk. Scott Shepherd replaces Craig Sibbald. Stephen Kingsley (Falkirk) wins a free kick in the attacking half. Substitution, Hamilton Academical. Mickael Antoine-Curier replaces Jason Scotland. Corner, Falkirk. Conceded by Ziggy Gordon. Goal! Falkirk 0, Hamilton Academical 1. Darian MacKinnon (Hamilton Academical) right footed shot from the left side of the box to the top right corner.